The spa park, which dates from 1906, underwent major rejuvenation work 100 years after its creation and has now been given a new look. The elongated stretch of park which had developed and matured down the years was linked sensitively to the changed sections and a curved “ribbon of gardens” was created as an effective central motif. It features a varied series of themed gardens grouped under the motto “Park of the Seasons”. The gardens create constantly changing impressions with their blossoms and colours and with the richness of their vegetation in combination with individual design elements. Special touches are added by the concluding “Magic Spring”, which symbolises the Hersfeld springs, by the fountain fields laid out relevant to the central axis of the spa rooms, and above all by the cherry grove, which blossoms impressively in spring. 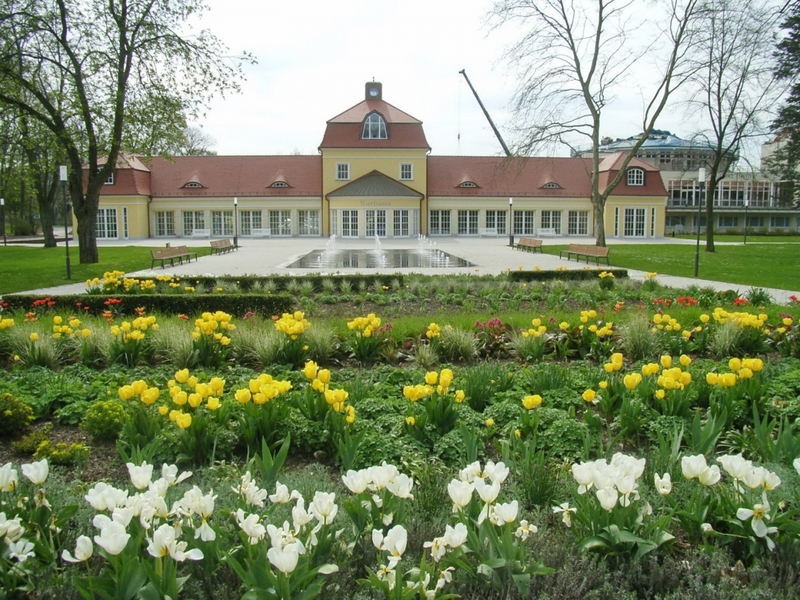 Remaining elements of the old park include the areas of grass planted with many different kinds of trees and shrubs, the fountain pond and the buildings at the side of the park, among them the municipal hall, the spa rooms and the spa thermal baths. Some of these structures have been partially redesigned. The spring pavilion was created at the entrance to the park in 2008. Its airy architectural design of wood and glass strikes a memorable opening chord. The spa park to the southwest of the old town centre and the area around the collegiate church (Stiftskirche) was created after the drilling of the “Lullusbrunnen” in 1904. This spring was named after Lullus, the founder of the town. What started in front of the spa rooms as quite a small park with a square surrounded by flower borders and newly-planted trees was gradually enlarged. Today, it covers approximately seven hectares. Typical elements of a spa park were added to the green space, including a wooden music pavilion (1909), a refreshment hall and finally, the still surviving “Swan Lake”. A completely new element was introduced into the hitherto rather traditional appearance of the park during the most recent changes of 2006 – the “ribbon of gardens” along its western edge. The link between the more recent and the older parts of the park was created by including the existing stand of trees in the design. The themed gardens which are laid out in succession along the western side of the park vary in size and are loosely separated by low hedges. At the same time, they are linked in many places by paths. A gently curving main path forms a border between the themed gardens and the older, tree-populated areas of grass in the central area of the park, also providing access to the various “rooms”. Their thematic variety and the imaginative way they are planted and ornamented present visitors with changing blossoms and colours from season to season as well as with original designs. In addition, they offer an opportunity to simply spent time relaxing in the park. The beginning of the “ribbon of gardens” is strikingly marked by the delicate spring pavilion, where both therapeutic waters bubble forth from the “spring stone”. 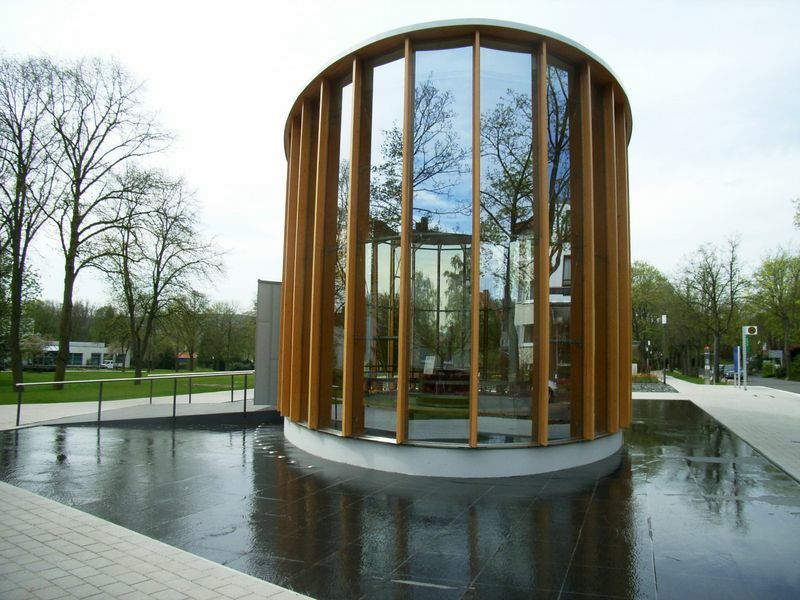 The building, which consists of a wooden framework completely covered in glass, is constructed on an elliptical layout and seems to hover above a field of water. In the evening, it is lit up impressively in blue and white, the town colours of Hersfeld. These also occur frequently in the plants in the spa park. While the smell garden by its nature particularly addresses the visitor’s sense of smell, the bamboo grove which comes directly afterwards makes one feel as if one were in a jungle. After crossing the axis, which is laid out relative to the spa rooms and planted with cherry trees at regular intervals, the visitor comes to the “cube garden”. A surprise is provided here by geometrically clipped shrubs such as hornbeam, box, privet and crab apple complemented by groundcovers like evergreen bluegrass and jimson weed. An area where a number of hydrangeas are assembled is followed by the “glass garden”, a clearly separated area with a strict regular layout. Here, pieces of glass and basalt stones are filled into long wire baskets, known as gabions. The glass and stones reflect the sunlight, thereby providing an unusual and charming contrast to the column junipers and herbaceous perennials. The garden next to this is the “Garden of Speaking Stones”, which has a character all of its own. Both it and a previously-erected older memorial are dedicated to Konrad Duden (1829 – 1911), who was director of the monastery school in Hersfeld until 1905. The title “Park of the Seasons”, which is the motto of all the areas of the park, is addressed directly in the western area by diverse sections planted in various ways – “Spring Ribbon”, “Summer Sun”, “Autumn Leaf” and “Winter Garden”. The “Magic Spring”, which symbolises the therapeutic springs, is already visible from a long distance. Mist rises at regular intervals from a central basin surrounded by several circular mounds of earth and spreads out over the surrounding area for a short time. The impressive impact which results from the misty cloud created from water under high pressure fascinates visitors and is one of the concluding highlights of the park. An older park exists around the impressive ruin of the collegiate church. Leonhard Müller, who commendably saved the church and who was also master architect of the Electorate of Hesse, created a park outside the town wall during the expansion of building beyond the town’s medieval boundaries from 1836 onwards. As was typical at the time, a park conceived in the spirit of landscape gardens was created, featuring large areas of grass bordered by paths with selected viewing points and planted here and there with open groups of bushes and trees. The newly created “catchment pond” was given an apparently natural shoreline. Even after all kinds of changes and modernisation work, Müller’s original planning can still be identified. The garden is named after him and he is commemorated by a memorial plaque. Accessibility: The main paths are suitable for visitors with limited mobility.